Superfights seem to be the trend in the UFC as of late. A rather interesting one has just been floated out. UFC bantamweight champion TJ Dillashaw is attempting to make history next week (Saturday, January 19, 2019). He’ll face Henry Cejudo for the UFC flyweight championship in the main event of UFC on ESPN+ 1. Should he win, he’ll be the fourth-ever “Champ Champ” in UFC history. “I think that would be more of a challenge to go up in weight than it has been to go down in weight,” Ludwig said. “T.J. is not a big bantamweight anyway. Going up in weight, that’s when we’ll see more change. 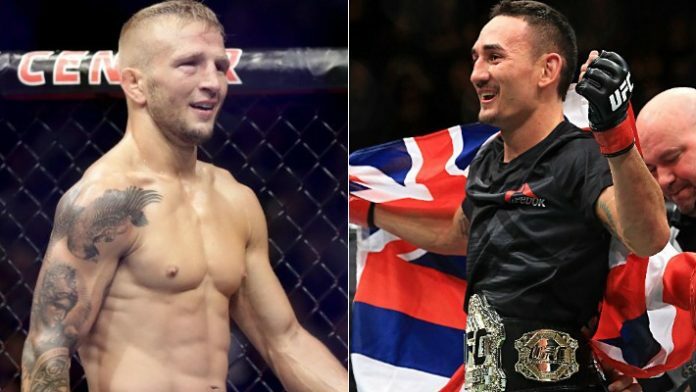 What do you think about Dillashaw saying he’d be interested in fighting Holloway at 145 pounds?